In early 1994, three Albright College students were watching Footloose during a heavy snowstorm. By pure coincidence, the next movie that came on the television was The Air Up There, another popular film starring Kevin Bacon. Intrigued by the coincidence, the students started counting how many films Kevin Bacon had acted in and speculating how many actors he had appeared on film with. It didn’t take long for the trio to turn their interest into a game, trying to link every actor to Kevin Bacon through a series of shared movie appearances. What began as an inside joke quickly spread across the nation and became a popular parlor game. Players may ponder: What series of films do you think Emma Watson and Kevin Bacon are linked through? You may be surprised: John Cleese links Watson with Bacon directly, leaving Watson with a “Bacon number” of 2 (the number of shared movie appearances linking Watson and Bacon). This game is now widely known as the Six Degrees of Kevin Bacon — named so because the Albright College trio had found that no actor is more than 6 shared movie appearances (“degrees”) away from indirectly collaborating with Kevin Bacon. Interestingly enough, the trio had stumbled across one of the first examples of the small-world phenomenon: Because everyone is so widely connected in modern times, we’re connected to every other human in the world by no more than 6 links of mutual friends. Apparently, the same rules apply to actor collaboration networks. 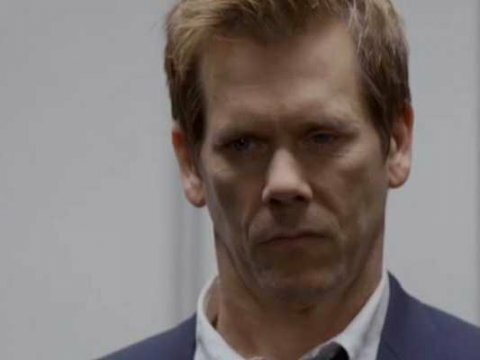 It’s been over two decades since the Six Degrees of Kevin Bacon was invented. We now have a massive database of movies and vastly more powerful computers to look at this problem. It’s about time we revisit the Six Degrees of Kevin Bacon to see if the trio’s findings hold up. The Albright College trio picked Kevin Bacon because he’s been a highly productive actor, appearing in over 60 films with a wide range of actors. According to the aptly-named Oracle of Bacon, Kevin Bacon has appeared in film with 3,031 actors during his film career. When the Oracle of Bacon calculated the Bacon number for 1.91 million other actors, the trio’s finding were validated: 99%+ of all actors have a Bacon number of 5 or less. Below, I charted distribution of Bacon numbers for all 1.91 million actors. Incredibly, there is a single actor out there who starred in such an obscure film that he/she has a Bacon number of 10. Props to you if you find out who it is. Alongside the Bacon numbers, I charted the distribution of “Roberts” numbers. Eric Roberts stands out as an actor who has had such a productive movie career that he has 379 movie and TV credits to his name as of March 2015. It’s no surprise, then, that Eric Roberts has appeared on the silver screen with 8,398 other actors — truly an unprecedented accomplishment in Hollywood. That’s right. You’d never guess it, but Eric Roberts — the movie villain who we’re always happy to see killed at the end of the movie — is the real Center of the Hollywood Universe. The most impressive part about Roberts’ career is how few links it takes to connect him to any other actor out there. 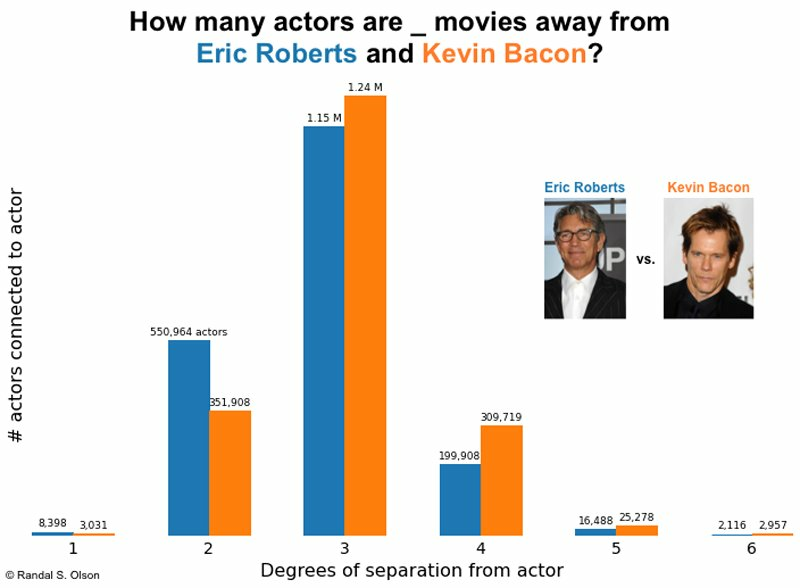 Shown in the chart below, 1 in 4 of the 1.91 million actors on IMDb are within 2 degrees of separation from Eric Roberts. 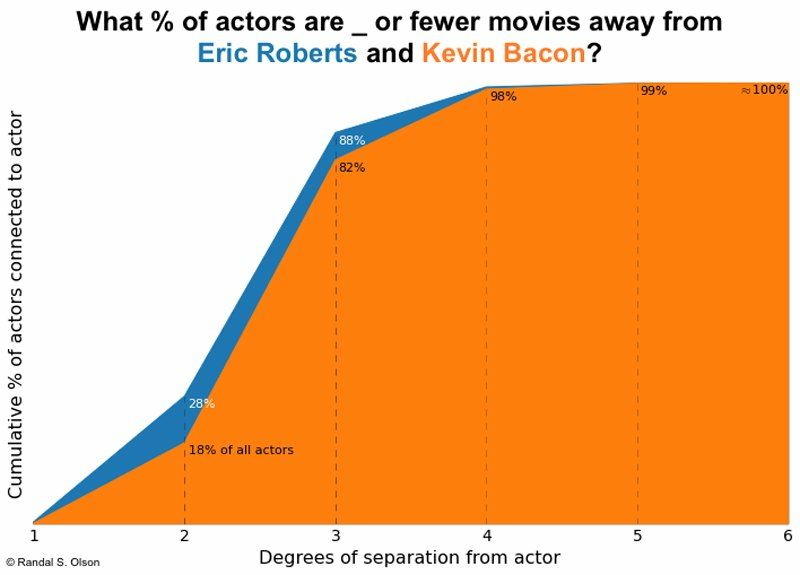 In contrast, fewer than 1 in 5 are within 2 degrees of separation from Kevin Bacon. By 3 degrees out, Eric Roberts can be connected to 88% of all actors out there, which includes nearly all of the well-known actors. At this point, it’s amazing that Kevin Bacon and Eric Roberts never starred in a movie together! My point? We should rename the Six Degrees of Kevin Bacon to the Three Degrees of Eric Roberts — or at least the Three Degrees of Kevin Bacon. Given that Kevin Bacon dislikes the Six Degrees game, I’m sure he would see this as a welcome change.